You have to respect Eagle for all they do concerning their artists’ current work and re-issues, as they have been on a serious roll lately in particular. The Montreux releases are rather in abundance and so are re-issues of past performances on both CD and DVD. 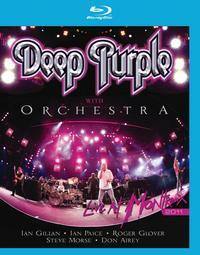 Enter BluRay, and you can add that format to the mix as well now, and this Deep Purple performance with Orchestra is the latest in a series Purple sets played there and released. It's their third Montreux DVD/CD package, and first in the actual BluRay format, although the last one was filmed in HD as well. One might also ask, is it really necessary to put out your next video and audio, when theact might run the risk of not varying enough to justify purchasing it. Well, I can point out that the differences are there, and can be easily distinguished without even watching it, as the package alone indicates. For instance, it's even redundant to some that they did an orchestra tour, as this band has certainly performed with orchestras before, more than once. In fact they were one of the first ever to combine symphony with rock, back in 1969. But make no mistake, this isn't anything like that. The orchestra on this 2011 tour was there for more of enhancement to the songs that built rock, or so they presented it as, rather than being featured any other way. Although, the conductor himself got a chance to really get involved in the arrangement of “Lazy,” taking a solo at the end which has to be seen. It is a remarkable feature to this product, and must have simply blown audiences away, and on this occasion it was combined with celebrating the festival’s long running existence. There have also been significant enough changes in the set list since their last Montreux release, as long as you're not too concerned anyway, and the addition of “Hard Lovin' Man” is one of them. It's somehow enough of a difference right there to justify the price of admission for die hard fans as well, as it really doesn't get much better when it comes to a Purple classic. So the fans are simply eating it up as they appreciate it being added, especially since they had never even played it live except for running through it at the BBC some forty years ago. The orchestra really does the job. I was skeptical about Deep Purple doing this, as it seemed to be for the sake of gimmick. All of the usual standards are lived up to in the process and it goes over a smash, proving the risk to be well worth it. Favorites are a personal choice so it's hard to choose set lists sometimes. So, although there is a song choice or two I would disagree with, this is a great set list. This is a must see, especially on BluRay, and if the visual aspect is not enough, or you're a collector, or even just prefer audio, you're in luck because it comes in CD, as well. You will not believe your eyes when it comes to the BluRay factor though, so combine that with arguably one of the greatest hard rock bands of all time, and you simply cannot lose. Also, since it is a November release, it makes a great gift.